Housing Update – dynamite to blast us out of our lethargy? Summary: Housing statistics are often misrepresented. Much of the analysis comes from industry shills, and the data during this downturn challenges the long-standing American love of real estate. Today the Census provides a powerful follow-up to Cutting through the fog to clearly understand the housing crisis. 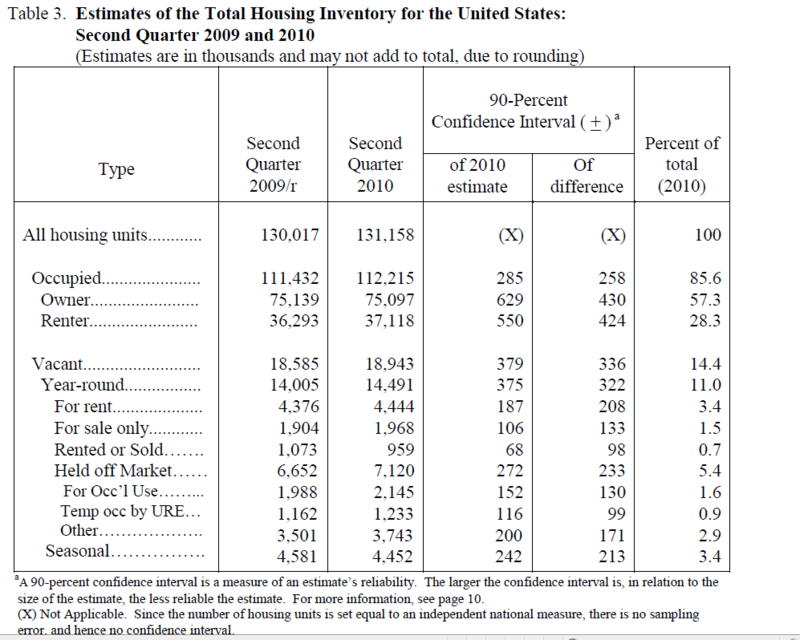 Today’s bleak news from the Census Department: a stunning and record-high 19 million housing units are vacant (18,943 thousand, 14.4% of all units)! Most articles about this report only the total “vacant for sale or rent” (one-third of the total vacant), ignoring the important “held off-market” category. Vacancies are up year-over-year (YoY) in every category except seasonal homes and vacancies due to recent sale/rental. The Census shows YoY comparisons to avoid seasonal effects (the data is not seasonally adjusted). Some fraction — perhaps a large fraction — of this national wealth (capital) eventually will be destroyed. Vandalized, burned, or deliberately plowed under municipal governments. A sad ending for an obvious and widely predicted crisis, but inevitable for a nation that allows it’s key public and private institutions to be easily hijacked by special interests for their personal benefit. That’s true of our wars as much as our housing-lending-WallStreetGambling crises. Our descendents will ponder with horror the record of a great nation pouring its wealth down the toilet. Perhaps these events will sharpen our wits and end our lethargy. Let’s hope so. The clock is running.